Great news! The first STUDY of the usability and impact of the Breastfeeding Solutions app appeared online September 20, 2018 in the Journal of Human Lactation. This small longitudinal prospective cohort study found that nearly 80% of the 29 women who used the app and completed the study surveys at 3 and 6 months were breastfeeding at 6 months. The local average of any breastfeeding at 6 months was 50%--nearly a 30% difference! The study’s aims were to explore the app’s usability among rural Australian women in a sparsely populated area and to describe the nursing outcomes of the study participants, comparing them to the local average. Because this study is not in an open-access journal, I’d like to share some of its details. Ultimately, the researchers concluded that the app fulfilled the need of these families for evidence-based information. If you are unfamiliar with how the Breastfeeding Solutions app works, watch its 2-minute video demo HERE. The app is available worldwide for Android and Apple devices through the App Store and Google Play. I am grateful to Australian researchers Nikita Wheaton, Jacinta Lenehan, and Dr. Lisa Amir for being the first to study the Breastfeeding Solutions app. I am also pleased that a larger study on the app is currently underway in southern California, where the plan is to include more than 200 families. Today’s parents expect to receive breastfeeding information and education in the formats and platforms they prefer. With more and more millennial families having babies, my hope is that the Breastfeeding Solutions app—which we can now recommend as supported by research—will find its way into the hands of many. Please help me spread the word. I’m delighted to announce the release of the third of three infographic I created with the fantastic people at Noodle Soup. Currently available only in the U.S., these two-sided sheets (one side English, the other Spanish) come in pads of 50. They are ideal for busy parents who want quick, cut-to-the-chase guides that are also lovely to look at. For Baby’s Caregiver, the latest infographic, describes specific ways caregivers can support nursing families, including how to pace bottle feeds to avoid overfeeding while mother is away. Pumping Primer, a simple guide to expressing milk that includes the most important points needed for successful pumping. Working & Breastfeeding, an overview of the key details that enable working and nursing families to meet their long-term feeding goals. Register HERE to listen to my 75-minute webinar recorded on Thursday, February 15, 2018 and sponsored by the nonprofit organization BreastfeedLA and Martin Luther King, Jr. Community Hospital. Registering will give you access to this recording during all of 2018! Content Summary: Why focus on exclusive pumping? We are in the midst of pumping epidemic! 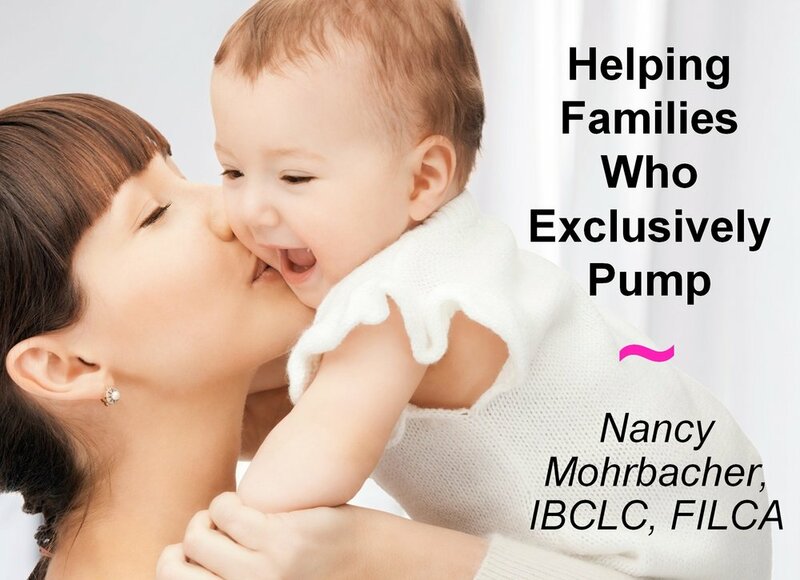 In "Helping Families Who Exclusively Pump," I will summarize pumping trends and describe the specific strategies that make it possible for families with babies in the NICU and those who choose to pump and bottle feed to most effectively build a healthy milk supply. I will also share what the research tells us about how often and long to pump in order to keep up milk production over the long term and ways to customize pumping plans based on an individual's breast storage capacity, a physical difference that varies from person to person. But these families need more than just reliable facts. They also need emotional support, so learn how we can best become the champions many pumping families genuinely need. Continuing Education Credits: For IBCLCs, 1.25 L CERPs are available and Registered Dieticians can provide the program agenda and certificate for CPEs for Professional Portfolios. For RNs, 1.5 contact hours are available through the California Board of Registered Nursing. For more details, see the downloadable brochure HERE. Support the wonderful work of BreastfeedLA while you learn! This year, my World Breastfeeding Week (August 1-7) gift to the world is an 80% discount on my Breastfeeding Solutions app. Usually $4.99 USD, until Aug. 7, you can download it for only 99 cents. No need for a promo code. For this limited time, my app will simply be available at this discounted price for Apple devices in the App Store and for Android devices in Google Play. Download it now at this one-time cost of 99 cents, and all future updates will be FREE. To learn more about the Breastfeeding Solutions app, scroll down to view its 2-minute video demo. Under the video, read its reviews. More than 30,000 people have downloaded the Breastfeeding Solutions app since its first version debuted in October 2013. The badges below are direct links to download Breastfeeding Solutions at its current discounted price. Will you please help me spread the word? I’d love for my friends around the world to take advantage of this unique opportunity to download my app at 80% off. Happy World Breastfeeding Week! To see how my app works, view this 2-minute video. amaag4: "Just recently I became concerned with my BFing supply. I was very worried and google was giving me mixed answers. An LC in my area posted this, so I decided to buy it. Within the first 10 seconds of looking through the app I found exactly what I was looking for. I can't wait to read through other concerns!" Vti10: "Latch issue solved. BFing had been going great up until the last week. Thankfully this app has helped baby & I to regain our wonderful BFing experience! I can't wait to read through all of the helpful topics!" To celebrate the holiday season and to thank those who made 2016 such a fabulous year for me, until December 8, I am slashing the prices of my books for breastfeeding specialists and offering a free US shipping option. Since Hale Publishing closed its doors this summer, my website is now the primary source of these books. During this sale, you’ll receive $10 off all the books in my store: my big hardcover, Breastfeeding Answers Made Simple, the Kindle and Non-Kindle BAMS e-books, and the paperback BAMS Pocket Guide. In addition, everyone who ships their order to a US address can receive free Media Mail shipping (a savings of up to $10 per book). To receive free shipping, as you check out of our online store HERE, choose the Media Mail option—which takes 4 to 14 days to arrive. For those outside the US, these books are now also available from distributors in Canada and the UK. If you buy these books from Login Canada at the links below, La Leche League Canada receives a portion of each sale. In Canada click HERE to buy BAMS and HERE to buy BAMS Pocket Guide. In Europe, click HERE to buy BAMS and HERE to buy BAMS Pocket Guide. If you are wondering when the next editions of these books will be available, due to prior commitments, the target release date for BAMS is 2019. So these sale books will remain current for quite some time. These comprehensive references are used worldwide by hospitals, health providers, public-health departments, and volunteer breastfeeding supporters. For details on volume discounts and prices of books for resale at your event, go to my online store HERE, click on the book image, and scroll down. Questions? Please contact our customer service at info@nancymohrbacher.com. To celebrate the opening of my online store, until July 1, 2016, my gift to everyone who orders books shipped to a U.S. address is the option of free Media Mail shipping. (This is a savings of $12 per copy of Breastfeeding Answers Made Simple over its previous shipping cost.) Whether you order one copy or order in bulk, to take advantage of this offer, as you check out, choose the Media Mail option—which takes 4 to 14 days. If you need your book faster, choose U.S. Priority Mail, which will require paying a shipping fee. Why am I selling books? In 2010, Hale Publishing began publishing my books for breastfeeding specialists, Breastfeeding Answers Made Simple (BAMS) and its Pocket Guide. Now Hale Publishing is closing, and I’m delighted to announce that moving forward my company, Nancy Mohrbacher Solutions, Inc., is the primary source of these books. Both BAMS, my large, evidence-based counseling guide and its smaller Pocket Guide cousin are now available in my online store HERE. In case you’re curious, due to prior commitments, revised editions of these book will not be available for at least three years. So these editions will remain current for quite some time. These comprehensive reference books are used worldwide by hospitals, health providers, public-health departments, breastfeeding peer counselors, mother-to-mother support volunteers, and many others. I am grateful to Dr. Thomas Hale and his daughter Monica Bull for making these books available in years past and for their generosity now in transferring their ownership to me. For retail orders, please use our online shopping cart. For details on volume discounts and prices of books for resale at your event, click on the image of the books in the store and scroll down. Questions? Please contact our customer service at info@nancymohrbacher.com. My body is not like most. The internet tells me my odd deformity will not shorten my lifespan, but it makes me different. It affected my breastfeeding experience, but what was truly unexpected was the way breastfeeding affected my most peculiar body. Why should you care? And why should I reveal now my unusual quirks in such a public way? While this account may be too much information for some, my story may give hope to women struggling with milk production. So here goes. I appeared normal at birth. My mother told me she first noticed my defect when I was about 3 years old. My breastbone, or sternum, began to indent, creating a cavity in the middle of my chest. My mother said she couldn’t find anyone on either side of our family who had this or knew of anyone else who did. Our doctor told her not to worry. When puberty hit, I noticed breast buds growing in my left breast but not in my right. As my teen years passed, my left breast developed normally but my right side stayed completely flat. At age 21, my parents offered to pay for cosmetic surgery, and I decided to do it. By this time, my sternum was deeply indented and my heart was pushed to one side. (Let’s hope I never need CPR!) The plastic surgeon inserted a silicone breast implant through an incision below where my right breast should have been, and he positioned the implant sideways, so that I now had a right breast and my chest indentation was filled in. I didn’t look 100% normal—my chest was still a little sunken below my collarbone—but it was better, and I didn’t feel nearly as self-conscious. From age 29 to 35, I gave birth to my 3 boys, and I spent a total of 12 years breastfeeding them, nursing on both sides. When I was 5 months pregnant with my first, I learned at my first La Leche League meeting that women could exclusively breastfeed twins and triplets, so I deduced correctly that one working breast was all I needed. Eventually she found my implant on images taken in my cleavage area. She told me my implant’s location had shifted. By this time, my sternum had become so deeply indented that it nearly reached my spine. (Yes, that grosses me out, too.) Over the years, as the indentation deepened, my breast implant fully migrated into the middle of my chest. Yet even without any implant remaining in my right breast, it now appeared to be fully developed. I was stunned to realize that my formerly “bionic” right breast was now a real breast. How did this happen? Science tells us that a woman’s milk-making glands grow and develop during pregnancy, and after birth this milk-making tissue continues to grow (study HERE). We also know that with breast stimulation, women who have never been pregnant can grow functioning breast tissue and produce milk for adopted babies (article HERE). I was aware of all of this when my mammogram tech gave me the news, and I knew immediately that my 12 years of nursing had gradually grown a real right breast where none had grown before. How can my strange story help others? Some women plan to breastfeed only to learn that their breasts didn’t develop normally. Called “breast hypoplasia” or” insufficient glandular tissue,” in this situation, there are not enough milk-making glands to produce 100% of the milk a baby needs. (See a wonderful book about this HERE.) This might also happen in a woman with a history of breast reduction surgery (see a another wonderful book HERE) or a transgender man who has had top surgery to remove breast tissue and later delivers a baby. It can be devastating when someone highly motivated to exclusively breastfeed cannot. Breastfeeding is a part of our sexuality, and when a woman discovers she can’t do what others seem to do so naturally, it is a genuine loss—like infertility—that deserves to be acknowledged and mourned. In my private lactation practice, I sometimes sat and grieved with a mother who had to face this heartbreak. Part of my job in that situation was also to discuss her remaining options. Most assume that giving up on breastfeeding is the only choice, but that is not actually true. Today, when I meet women who are struggling with low milk production, I always share my story. My long-term perspective gives them a glimpse not only of their options today, but how their choices now may affect their breastfeeding future. Mothers who produce less than 100% of the milk their babies need can continue to breastfeed while giving supplements of donor human milk or formula. And they can give these supplements in a number of different ways, including something called an at-breast supplementer, pictured here. These devices allow baby to receive any needed milk through its thin tube while baby nurses at the breast. These at-breast supplementers can be tricky and irritating to use (study HERE). But for a woman with little functioning breast tissue, while using these devices, baby continues to stimulate breast growth. If she nurses for months or years, over time this will grow more breast tissue and increase her milk production for this baby and future babies. These devices also give women who value the closeness of breastfeeding a way to nurse 100% of the time whether they make milk or not. Many adoptive mothers and mothers of babies born via surrogate use these devices so that they can fully experience the intimacy of breastfeeding. An at-breast supplementer is usually used no longer than one year and sometimes for a much shorter time. After a baby starts eating solid foods at around 6 months, baby’s need for milk steadily decreases. At some point--8 months, 10 months, 12 months--the mother’s breasts alone meet baby’s need for milk. At that point, mother and child can nurse for as long as they like without the need for supplements. Of course, using an at-breast supplementer is not necessary. Some supplement their babies in other ways—feeding bottles, cups, spoons--and breastfeed to give comfort and whatever milk they produce. For both mother and baby, from a health standpoint, some breastfeeding is always better than none. But many mothers value the bonding of breastfeeding most. As my story shows, women dealt a low-supply card have choices. And some of these choices have the potential to change their breasts and increase their milk production in the months and years ahead. They deserve to know that they can stack the deck in their favor both for their current baby and for babies to come. If my story gives these women hope and a new perspective, I don't mind sharing my peculiarities with the world. I’m delighted to be on the planning committee of a two-day conference geared to those helping breastfeeding families during the first month of life. “Breastfeeding the Neonate” includes some of my favorite speakers—Nils Bergman, Diane Wiessinger, Catherine Watson Genna—and to make it even more wonderful, it will be held in Orlando this coming February 8 and 9. As a Chicago native I’m thrilled to have a chance to hear some of the best speakers in our field while enjoying a little warmth and sunshine. How about you? If you’re feeling tempted, don’t wait to register. There are only 200 seats available, and with this amazing roster of speakers, I expect these 200 seats to fill quickly. All of the conference details are available HERE. This event page also includes links to online registration. You may download the conference brochure HERE. 12.25 L CERPs have been awarded for this event by the International Board of Lactation Consultant Examiners, and this activity has been submitted to the Ohio Nurses Association (OBN-001-91) for approval to award contact hours. The Ohio Nurses Association is accredited as an approver of continuing nursing education by the American Nurses Credentialing Center’s Commission on Accreditation. Conference registration also includes a Dessert Reception with the Speakers on Monday evening to give you special one-on-one time with these incredible people. This conference is sponsored by Family Health Coaching, a wellness organization run by Dr. Theresa Nesbitt, the obstetrician who appears in many of the videos on my YouTube channel HERE. Dr. Theresa will also be speaking on the Neurology of the Newborn and joining me for two other talks. Take a break from winter to update your breastfeeding skills and knowledge. What makes a breastfeeding newborn different from an older nursing baby? How should these differences inform our approach? Based on the most current research and clinical insights, our international experts will share practical and effective strategies for the initiation and continuation of breastfeeding during the neonatal period. We hope you can make it! Why Do Milk Storage Guidelines Differ? Reading different milk storage guidelines from different sources can be crazy making! Which guidelines are right? Why don't the experts agree? What do you really need to know? The good news is that there are logical explanations for these differences. And once you know them, you can store and use your milk with confidence. In the guidelines provided at the end of this post, some storage times for refrigerated and frozen milk are labeled “Okay” while others are labeled “Ideal.” Within the “Okay” times, expressed milk should not spoil. Between "Ideal" and "Okay," the milk is still good, but more vitamins, antioxidants, and other factors are lost. Some health organizations, like the Academy of Breastfeeding Medicine, recommend the shorter "Ideal" times because they prefer you use your milk before this loss occurs. It is always better to use your milk sooner rather than later, but your milk should not spoil within the "Okay" time frames. Milk found in the back of the fridge after 8 days will still be far better for your baby than formula. What Temperature Is Your Room? Some milk storage guidelines also vary because they define room temperature differently. If you live in a tropical or subtropical climate, the higher room-temperature range in the guidelines below may better fit your reality. In the temperate zones, the lower range may better fit yours, at least during colder seasons. Storage times for fresh and refrigerated milk are longer than for previously frozen milk. Freezing kills live cells in the milk, which protect milk from spoilage. When the milk's live cells are dead, it spoils faster. When in doubt, smell or taste it. Spoiled milk smells spoiled. 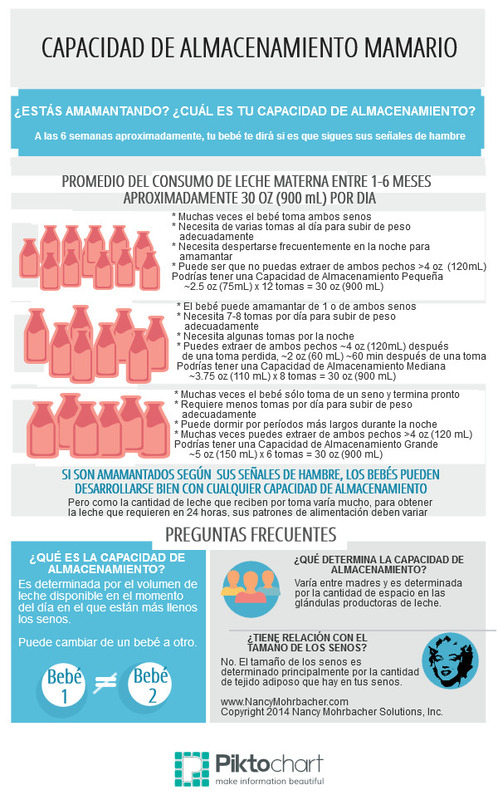 If you’re still in doubt about which guidelines to follow and how best to store your milk, ask yourself the following questions. Is your baby healthy? These guidelines are intended for full-term, healthy babies at home. If your baby is hospitalized, your hospital’s milk storage guidelines are likely shorter than these. Preterm and sick babies are more vulnerable to illness, so pumping and storing recommendations may be stricter. How much expressed milk does your baby get? If your baby gets most of her milk directly from your breasts, you don’t need to worry about whether the small amount of expressed milk she gets is fresh, refrigerated, or previously frozen. If a large percentage of your baby’s milk intake is pumped milk, consider your choices more carefully. Freezing kills antibodies, so rather than freezing all of your pumped milk, feed as much fresh or refrigerated milk as possible. But even without the antibodies, frozen milk is still a far healthier choice than formula. • Fresh, never frozen: 3-4 mo. • Fresh, never frozen: Ideal: 6 mo, Okay: 12 mo. Jones, F. Best Practices for Expressing, Storing and Handling Human Milk, 3rd edition. Raleigh, NC: Human Milk Banking Association of North America, 2011. Mohrbacher, N. Breastfeeding Answers Made Simple. Amarillo, TX: Hale Publishing, 2010. Does it make sense to focus on time during the early weeks of breastfeeding? Let’s take a closer look. What Do Number of Minutes Spent Breastfeeding Tell Us? One common recommendation is to make sure newborns feed at least 10-15 minutes on each breast and take both breasts at each feeding. But that’s not always possible. One mother and baby I saw in my private practice stand out in my mind. This mother called me with concerns about her 5-day-old daughter. The baby was born at just 5 pounds and she would only take one breast for 5 minutes before completely shutting down. She also refused one breast completely. I scheduled a home visit and brought my trusty scale. Unlike scales for sale at baby stores, this one was so accurate (to 2 grams) that it could reliably measure baby’s milk intake at the breast. First I weighed her little girl with her clothes on for a “before” weight. With some small tweaks in positioning, we convinced her to take the breast she had previously refused. I watched her as she nursed. I didn’t see much jaw movement, and I didn’t hear any swallowing. Sure enough, after 5 minutes, she came off her mother’s breast and was unwilling to continue. I put her back on the scale and to my amazement discovered she had taken 2 oz. (60 mL) of milk, way more milk than most babies this age take during a breastfeeding. (At 5 days, average milk intake per feeding is more like 1 oz., or 30 mL.) When this mother realized that her baby was such a fast, effective feeder, she relaxed. Her baby was doing fine. Later that day, I saw another mother and her 10-day-old baby boy. This mother was worried because her little guy was spending more time nursing than she was told was normal, around 55 minutes at each feeding. This time my scale showed that he consumed the same amount of milk (2 oz. or 60 mL) in 55 minutes as the baby girl had taken earlier in the day in 5 minutes. Rather than being a fast eater, like the little girl, this baby boy was a slow eater. How many minutes should a baby breastfeed? There’s not a simple answer. Just like adults, some babies are fast eaters and others are slow eaters. The number of minutes your baby feeds does not tell you anything about how much milk he consumed. On average, it takes most newborns somewhere between 5 and 55 minutes to finish a breastfeed. Both fast and slow nursers usually have periods of wide jaw movements along with some pauses. Over time, most babies get faster and more efficient at breastfeeding, so as they grow, the slow eaters usually speed up and get the same amount of milk (or even more milk) in less time. Also like adults, your baby may be hungrier at one feed than another, so feeding longer or shorter at different feedings is not a cause for concern. This is perfectly normal. Being finished after one breast at some feedings and wanting both breasts at some feedings is also perfectly normal. Does the Number of Minutes Between Feeds Mean Anything? Most tiny babies need to breastfeed at least 8 to 12 times every 24 hours, but many parents do the math and assume this means they should expect their baby to be satisfied for 2 to 3 hours between feedings. Until your baby is a little older, usually after about the first 40 days or so, regular feeding times are uncommon. This 2-minute YouTube video from my YoutTube channel explains what to expect during the first 40 days. As it describes, in the beginning, most breastfed newborns bunch their feedings together during wakeful times or “cluster nurse.” For this reason, it’s not helpful to focus on when baby fed last. Whenever baby shows feeding cues (increased activity, rooting, mouthing), assume it’s time to breastfeed again. Yes, even if it’s only been 10 minutes. If baby seems hungry again soon after feeding, don’t worry about overfeeding and don’t consider it a reflection of your milk production. It’s just what newborns do. This is how your baby helps you build a healthy milk supply. There is no value whatsoever in trying to convince your baby to go for longer stretches between feeds. Newborns have no sense of time, and putting your baby off only adds stress to your life. If your baby seems interested in feeding or is fussy, try nursing first, and if that doesn’t help, move on to other comfort techniques. As your baby grows and matures (and his stomach grows and can hold more milk), he will naturally become more regular in his feeding patterns. You don’t have to do anything to make this happen. How Long Is It Okay for a Newborn to Sleep? Beginning on about second night after birth, don’t be surprised if your newborn goes into a feeding frenzy just about the time you’re thinking about going to bed. Most babies are born with their days and nights mixed up. That’s why it’s best for the sake of your own rest and recovery to sleep when your baby sleeps so that you’re rested and ready for more feedings at night. It’s not uncommon for a brand-new baby to have one 4- to 5-hour sleep stretch, but it is often during the day. As long as your baby fits in at least 8 feedings every 24 hours and is gaining weight well (after Day 4, an average of about 1 oz. or 30 g per day), there’s no reason to wake your baby to feed. It usually takes a few weeks for your baby’s body clock to get closer to yours. To speed up this process, try keeping stimulation to a minimum at night (lights low, sounds low, no diaper changes unless baby has a stool). Make daytimes full of light, sound, diaper changes, and before you know it, baby will be taking her longer sleep stretch at night. Your baby’s feeding patterns are not a reflection of your milk production. But there are other ways you will know that your baby is getting the milk she needs. Her stool color is one sign. If breastfeeding is going well, your baby’s stool will turn from black to green by about Day 3 and green to yellow by Day 4 or 5. Weight gain is the best way to gauge your baby’s milk intake and your supply. Once baby reaches her low weight on Day 3 or 4, expect a weight gain of about 1 oz. or 30 g per day. Weight gain is the gold standard of healthy milk intake and milk production. When it comes to breastfeeding and the clock, keep in mind that breastfeeding has been around much longer than clocks. In other words, you don’t need a clock to make breastfeeding work. Sometimes too much focus on the clock can even cause problems by shifting your focus away from what really matters. Your baby will tell you everything you need to know. The American Academy of Pediatrics recommends breastfeeding babies on cue rather than on a schedule. (See its 2012 policy statement HERE). Don’t be distracted by the clock. Instead, watch (and trust) your baby. "Breastfeeding and Work: Let’s Make It Work!" is the 2015 theme for World Breastfeeding Week (WBW), which in my part of the world happens August 1-7. The official WBW materials are now available at worldbreastfeedingweek.org. As you make your WBW plans, if you like my “Made Simple” approach to breastfeeding, please consider some of my creations. If you’re looking for books for giveaways, my 2014 Working and Breastfeeding Made Simple—available in paperback and e-formats—is the most up-to-date resource for employed mothers. You can hear me talk about its approach on my latest podcast here. Want details on bulk discounts? Contact scott@praeclaruspress.com. Brand new last week from Noodle Soup (and perfect for busy millennial moms) is my Working and Breastfeeding infographic (left), available in tear pads of 50 for $10. One side is English, the other side Spanish. You can order it online here. 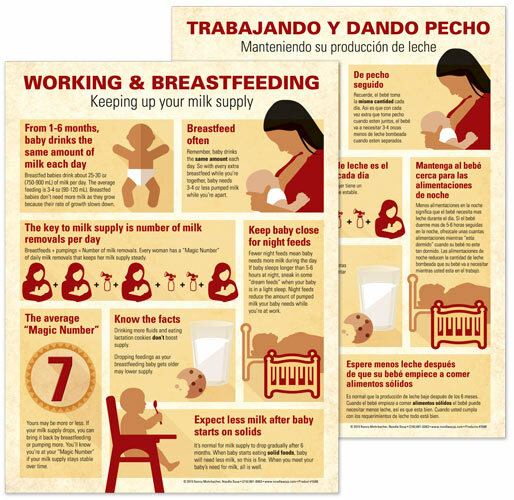 Also available through Noodle Soup is my brand-new low-literacy brochure, Ten Tips for Working and Breastfeeding (right), which you can order online here. At $0.22 each, it is the newest addition to Noodle Soup’s Ten Tips series. I always love hearing about the many ways you celebrate WBW. Have a great one! Mother's question: "I need help! My daughter is a week old tomorrow and I can’t seem to get my milk flow under control. It just pours out and she chokes. What do I do to make it easier for her?" During the early weeks, while your milk supply is adjusting to your baby’s needs, your feeding position can make all the difference. If you sit straight up during feedings, your milk flows downhill into your baby’s mouth, which makes coping with milk flow more difficult for her. Instead, use positions like those pictured here. Move your hips forward and lean back with baby’s whole body resting on yours so your baby’s head is higher than the breast. In these positions, gravity makes milk flow easier for her to manage. Many mothers also find these positions much more comfortable. You can read more about these positions at this post. Most important is never to hold your baby’s head to your breast when she wants to pull off and catch her breath. Fingers crossed these tips help!